The Des Moines Water Works filed suit in U.S. District Court this week against the supervisors of Buena Vista, Calhoun and Sac Counties claiming their drainage districts have cost the utility thousands of dollars to remove nitrates from the water that it draws from the Raccoon River. Iowa Agriculture Secretary Bill Northey says he understands the challenges before the Des Moines Water Works, but says the lawsuit is the wrong way to bring about change. Northey has been working to get farmers and others involved in voluntary programs to improve water quality. Northey says the work should be in the watershed, not the courtroom. “And all the money that’s spent on that legal process, I think it would be a lot better spent putting practices on the ground, working with our landowners, improving our technologies to be able to keep those nutrients on the land,” Northey says. He says the lawsuit could set a bad precedent that would allow more suits against other counties and many others. “Every other drainage district and any user along the way, obviously it would be such that they could sue somebody up river. 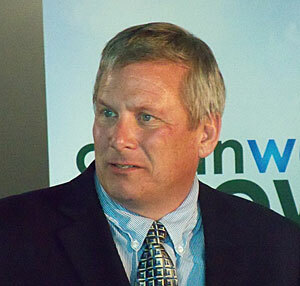 Obviously, Ottumwa could sue Des Moines for any type of water qualities that they have,” according to Northey. Northey says the issue may come down to who owns the water, and should entities be able to dictate to upstream districts specific terms for water quality.